GREEN BAY — Head Coach Mike McCarthy challenged his inside linebackers in remarks McCarthy made in his post-practice press conference on Tuesday. “It’s a big opportunity for inside linebackers and they need to start making more plays, frankly. They need to settle in and start playing,” McCarthy said. 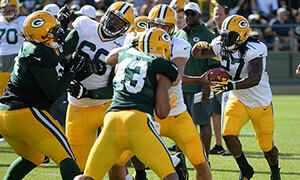 Other aspects of the Packers’ play in practice met with the coach’s approval. “The corners as a group are off to a good start. They’re getting their hands on the ball. I think we’ve got some young guys who do a really good job getting their hands on receivers,” McCarthy said, referring to a bump-and-run drill. “I think Richard Rodgers has definitely taken a step from last year. He’s had some dominant plays in special teams. You think about where he was at this time last year,” McCarthy said of the second-year tight end. Click here for Packers.com’s full report following locker room interviews.